Has your property experienced storm damage in Orange, California? High windows and hail can damage roofs, siding and windows in area properties. Call the company that can get there quick to contain the damage, prevent further damage and restore your property to it's pre-storm glory: West Coast Restoration Inc.
High winds in Orange damage houses and commercial buildings, especially when speeds exceed 50-60 miles per hour. Depending on the severity of the winds, trees can be uprooted or large branches can fall. High-speed winds in Orange can result in devastating damage to your home's siding, fences or roof. West Coast Restoration Inc provides total restoration of wind-damaged properties in Orange. Once a severe storm strikes and winds heighten, the updrafts of the wind can cause hail to form. Dirt and dust particles from the strong winds are carried high into the cold, top sections of storm clouds, and once those particles freeze, the tiny balls of ice are formed. Once the updraft of the wind weakens, the hail will fall. More than just vehicles are vulnerable to hail damage. When hail can cause damage to your roof in Orange, and your siding and windows. Hail damage in can cause punctures, rips, and tears, or bruises in the shingle mats of your roof. Hail can pelt your windows and your siding, leaving holes or punctures. If you require siding or roofing repairs from Orange storm damage, call the restoration experts at (714) 584-4894 today. As unpredictable as weather can often be, a severe storm can happen fast. As a storm can quickly intensify, high winds start to roar and pouring rain and potentially large hail start to fall. Wind and hail can cause damage to your property. When disaster strikes from Orange storm damage, restoration should be swift and effective. 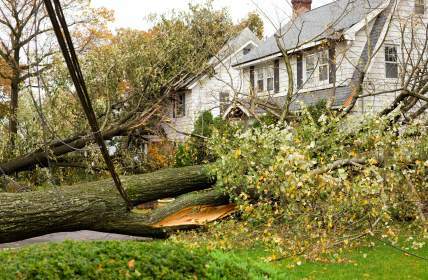 You need a competent restoration company to provide effective, dependable storm damage restoration in Orange. Since 1990, West Coast Restoration Inc has specialized in efficiently returning storm-damaged properties to normal and helping customers restore peace of mind. With over 29 years experience in storm damage restoration in Orange, West Coast Restoration Inc has been providing reliable Orange storm damage repair from hail and wind that you can trust. Our fast response time to a storm disaster in Orange helps minimize any further potential damage to your property or contents and helps keep the storm damage repair costs down. Our Orange restoration team at West Coast Restoration Inc will assess the Orange storm damage and will plan our solution for restoring your Orange property to its pre-damaged condition. We will properly secure your Orange property in a timely manner and ensure insurance claims are processed smoothly. West Coast Restoration Inc has been providing exemplary restoration for Orange storm damage for over 29 years. Call (714) 584-4894 for FAST response! 5★★★★★ - "On May 13, my house had a magnificent flooding in the restroom. So I decided to call West Coast Restoration the next day on May 14. In doing this, they responded almost immediately after in a decent way. On the same day, they put the machines in and cut the dry walls. And within the week, they moved my furniture and garage stuff to the local storage. I would also like to mention that Sam and his team were very helpful in assisting me in moving and restoration. Sam also handled the process with my insurance company. The process was quick and professional." 5★★★★★ - "We got great water damage restoration service from West Coast Restoration of Orange County. Highly recommend." 5★★★★★ - "Thanks for exceptional service and great attitude. Sam took the headache of dealing with insurance and processed the claim with great speed. His professionalism and guidance helped us with our water damage crisis. At the end the house looked better than before." 5★★★★★ - "So, coming home to a flooded home wasn't the best scenario, but Service Pro 24 was able to keep it from becoming a complete nightmare. If you ever find yourself with a plumbing disaster or other water mitigation issues in your home, don't panic. Let the professionals at Service Pro Water Damage deal with the water cleanup tasks and help you get back to your life quickly."